They are my favorite two words, literally, when it comes to breakfast. Well aside from pancakes and coffee. So at least the top 4. If you thought I couldn’t possibly come up with another version, you thought wrong. I actually have 3 in my queue right now. I just try to space them out so as not to overdo it. And every time I ask readers what they want, it’s overnight oats! Gotta give you what you want! Recently, I shared a tasty new snack, Strawberry S’mores Pretzel Bites. These have become a weekly thing in our house and one of my favorite after dinner or after lunch sweet treats. And then my hometown favorite, Graeter’s, came out with S’mores ice cream. All this talk of s’mores had me thinking, how could I include this treat into breakfast but not in a way that I am sent into a sugar rush mid morning and then end up in a major slump before noon. Well, there is no rule in my book that says I can’t have marshmallows at breakfast–even though we had to sneak these goodies from the neighbor’s house growing up. But honestly, I don’t want too much of anything really sweet in the morning. These overnight oats could easily be a campfire breakfast this summer. I’m sure one big toasted marshmallow on top would do the trick. 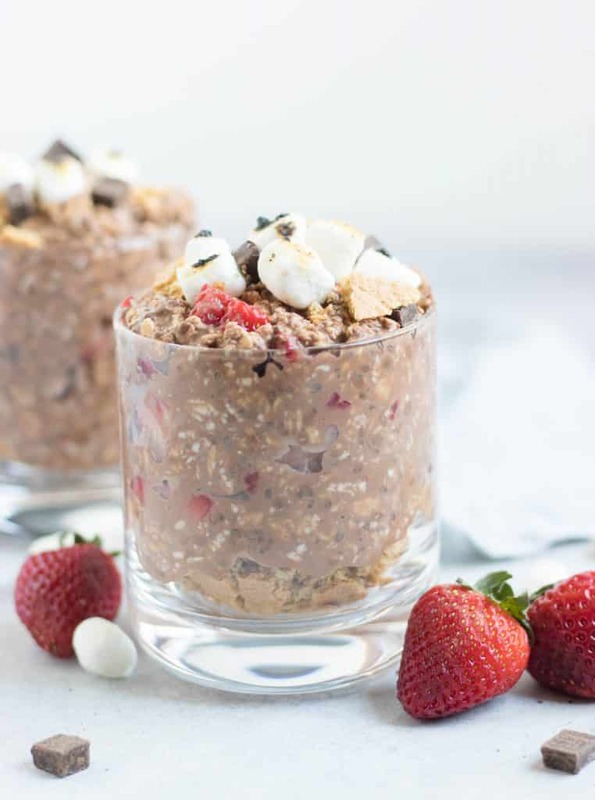 The combination of chocolate, strawberries, marshmallows, and crushed up graham crackers is a fun treat for breakfast. To say I have a thing for overnight oats that taste like dessert is an understatement. 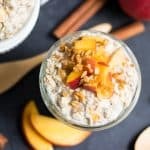 Let’s see, there’s Coconut Cream Pie Overnight Oats, Carrot Cake Overnight Oats, and even an Apple Pie Version, not to mention the Peanut Butter Cup Overnight Oats! It’s a very popular flavor. These are definitely going right into the dessert flavor category! You have some options with these so I will tell you what I did, but you can adjust accordingly. I love soggy graham crackers. Growing up, I dipped mine in milk and always loved them when all the milk had been absorbed and they were much softer. I like them in eclair cakes again where they have been softened a bit. So having them crushed up at the bottom of my oats was how I prefered them. You may not be in the same category and prefer yours crunchy. In that case, you can just crush them on top in the mornign when you eat them. I also brought a small flame over my marshmallows to toast them. Again, not necessary, and certainly a safety hazard especially for children. So please use caution if that is what you decide. Everything else from there should be pretty same old, same old. Just stir it all together and chill. Doctor things up before serving and enjoy memories of sitting by the fire and telling ghost stories as you nibble on breakfast! Combine all other ingredients in a small bowl and stir well. Pour oats mixture on top of graham crackers and chill sealed overnight (or at least about 4 hours). Eat warmed or straight from the fridge in the morning. It’s a big winner!! Thanks! Oh wow – I’ll be trying these for sure! This looks amazing! Can’t wait to give it a try. Wowowow! This looks sooo good! Putting it on my weekend to-do list! It can be both right?! Wow! This looks so yummy. 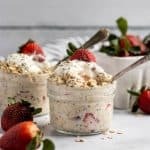 I’m a huge overnight oats fan, so that is for a new idea! This sounds so delicious! I can see my husband eating this up! I think this is my new favorite blog!! 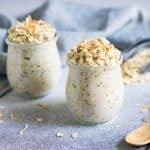 These sound amazing, but Peanut Butter Cup Overnight Oats!?? OMG! Ha, thanks! Yes, it’s an amazing combo! 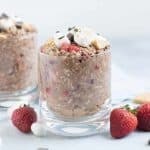 These overnight oats are a fun treat for breakfast! I’m sure the whole family would love these! These look so delicious, will definitely be trying them out! This is a great overnight oats idea! I think adding chocolate to any recipe is a great idea! I’m really excited to try these. I’ve been making a batch of overnight oats at the beginning of the week for my son to eat before we head off to high school for the day. His favorite so far has been the banana, but I think if I keep the strawberry and marshmallow out of these and add them in the morning he will like these (he needs texture contrast). Sounds perfect Millie! I enjoyed having a handful of marshmallows in my breakfast! This looks so amazingly good. My husband is on a oatmeal kick right now so this is right up his alley. I will need to go shopping for a few ingredients, but I hope I can make this one soon. Hope he loves it!! Eating this one made me feel like a kid!